A huge blaze engulfed a scrap yard in Sheffield in a suspected arson attack. The fire broke out at the site on London Road, near the junction of Chesterfield Road, at about 18:40 BST on Friday. 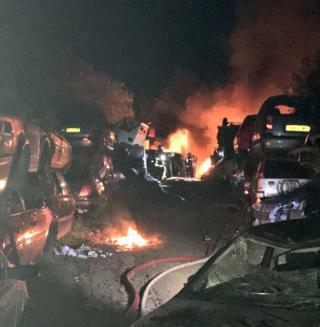 No-one was hurt but 10 cars were destroyed in the blaze, which was started deliberately, South Yorkshire Fire and Rescue Service said. Up to 20 firefighters tackled the blaze, which was put out shortly before 22:00. A joint investigation by the police and fire service has started.